There’s been a lot of talk recently about whether or not you have to be a consumer of a product in order to be a great brand manager for that product. On one side of the aisle, some believe that being a consumer of a given product actually hinders your ability to bring a new perspective and think objectively. On the other side, you have the school of thought that being a heavy user helps you understand the mind of the consumer better and that your passion for the product will power you through the ebbs and flows of the job’s demands. Both sides have valid points; but, no matter which you agree with, you’ll always need the passion to be there – whether that comes from learning about a product that’s entirely new to you or from working on one of your favorite brands. While some of my fellow AMPers were introduced to their brands for the first time this summer, one thing was for sure with my internship – no introduction was necessary. Having consumed Wendy’s best-selling chicken sandwich on a near weekly basis for as long as I can remember, I entered this summer with a fiery passion to uncover consumer insights, competitive innovations, and macro spicy food trends. All of this has culminated in developing a three-phase strategic marketing plan over the next six, twelve, and eighteen months for growing this brand that already has such a wide appeal. 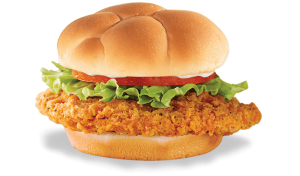 That’s right people – we’re talking Spicy Chicken Sandwiches. The best part about working on the Spicy Chicken Sandwich brand is how incredibly passionate consumers are when we ask them to talk about what the sandwich means to them. As part of my data collection efforts, I worked with Wendy’s Consumer Insights team to interview almost 400 people who each had their own story as to why they love the sandwich. And the love for Spicy Chicken extended to all of Wendy’s as well. One person even wrote about how they loved Wendy’s so much that they received chairs and a table from a Wendy’s restaurant as a wedding gift! That kind of enthusiasm is any aspiring brand manager’s dream. It makes it that much more exciting to jump out of bed in the morning knowing that what you’re working on means a lot to a whole lot of people. It’s what fuels the Wendy’s team to be some of the most creative, brilliant, and passionate people that I’ve ever worked with. But whether or not that’s a byproduct of the intermittent free Frosty is another story. This summer has been an experience that I’ll never forget, mainly because I had the chance to work on a product that’s one of my favorites in the entire consumer landscape. And it’s taught me that no matter what brand you ultimately work on or what company you ultimately work for, it needs to be one that you love talking about, love thinking about, and preferably, love eating.